DATx nodes are a crucial part of the DATx X-DPOS consensus mechanism; they are responsible for ensuring the security and efficiency of the entire DATx ecosystem. Much like the DPOS system implemented in other projects, nodes are elected through users staking their platform token, DATx token, to vote for node candidates. With a fewer number of nodes producing blocks, the system operates more efficiently, enabling vertical scaling of the blockchain with high TPS (transactions per second). In the X-DPOS system however, the addition of cross-chain interoperability functionality will also allow for horizontal scaling, with nodes interacting with other chains. Different node types will work in tandem to achieve coordinate on-chain and off-chain transactions, establishing cross-chain interoperability between DATxChain and supported chains such as BTC, ETH, and EOS. · Anchor Nodes (AN): Top 21 candidates from the node elections. They will be responsible for producing blocks and coordinating mapped asset distribution to users. They will be awarded 25% of the node reward fund and will be up for re-election every 63 seconds. · Cross-Chain Validators (CCV): Top 15 candidates of the first round of elections (they will serve as ANs concurrently for the very first round of elections). At the beginning of each interval of three months, the top 15 candidates of the node election will become CCVs. CCVs bear the responsibility of signing off on transactions from the DATx MSE (multi-signature escrow wallet) to user wallets off-chain. This entails that they are responsible for user off-chain assets. They will be awarded 35% of the node reward fund. · Candidate Nodes (CN): Top 101 candidates from the node elections. Those not in the top 21 will be responsible for taking over for ANs and CCVs should problems arise. All CNs will be awarded 40% of the node reward fund in proportion to the votes they receive. Elections will occur every 63 seconds. 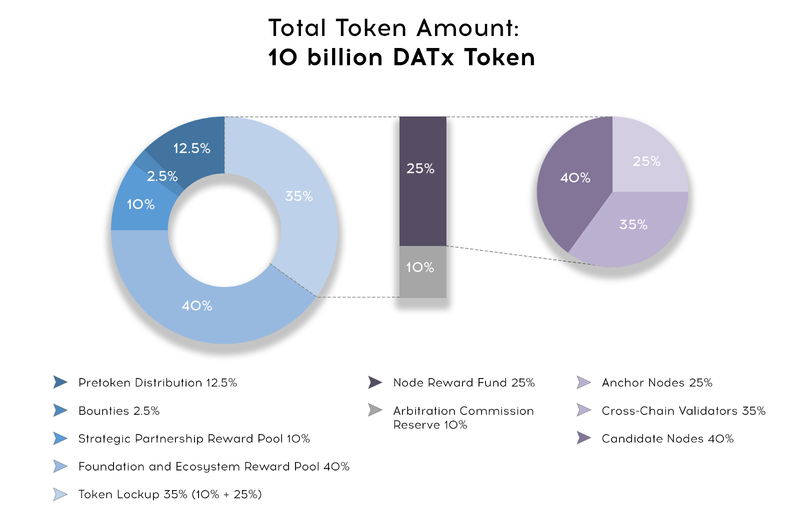 The DATx Node Reward fund will be 25% of the total 10 billion DATx tokens, as part of the 35% of DATx tokens in lockup. 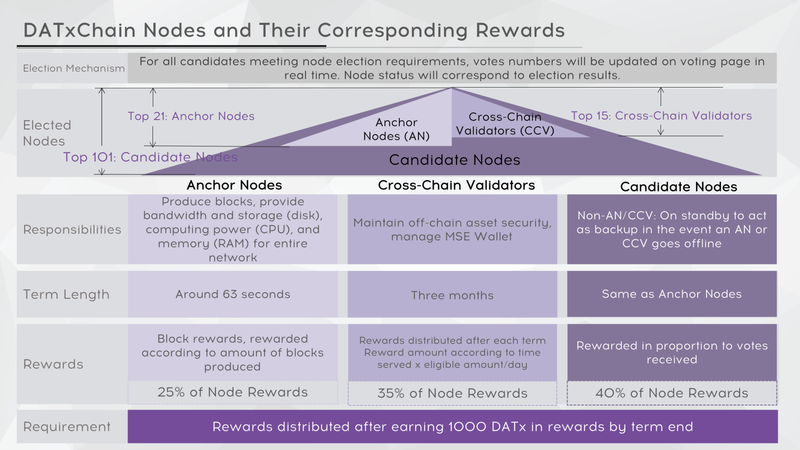 Each year, 100 million DATx token will be unlocked and distributed for node rewards (25% for AN, 35% for CCV, and 40% for CN). The growth of the DATx ecosystem has been sustained by consistent community support. With the opening of node candidacy to the DATx community, the DATx team is confident that the community will step up to establish a truly transformative cross-chain ecosystem with the DATx team. At launch, the DATx cross-chain ecosystem DAPPs will be able to reach over 60% of the current blockchain industry market capitalization by aggregating market capitalizations of different blockchains. In comparison, ETH and EOS can only incorporate their own market capitalizations, respectively 12% and 2% at DATx testnet launch. As a value aggregating blockchain ecosystem, the official launch of the DATx ecosystem will herald in a new era for DAPP developers and the blockchain industry as a whole.